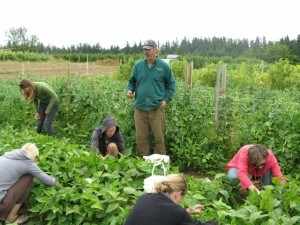 The home base for our EduCulture Project is historic Suyematsu-Bentryn Farm, the oldest working landscape on Bainbridge Island, and one of the largest farms in Kitsap County. Since 2006, we have been collaborating with the farmers at Suyematsu-Bentryn Farms to transform their working landscape into a center of teaching and learning for K-12 and community based education. 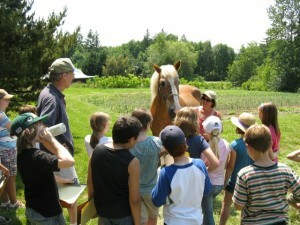 Over the past few years, this land has been an experiment in bridging sustainable local farming with education for sustainability, and offer lived experiences for teachers and students that cultivate scholarship, stewardship, citizenship and sustainability. 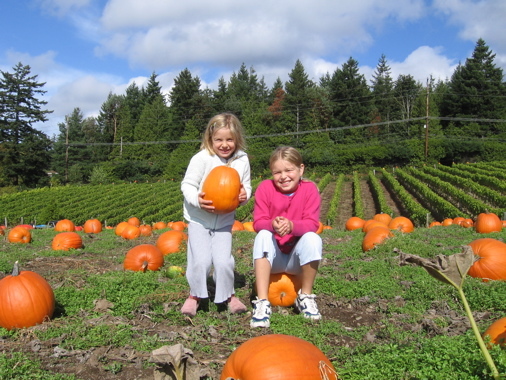 Started by the Suyematsu Family in 1928, it is the oldest, most continuously farmed land on Bainbridge Island, and the last of the large family farms that at once made Bainbridge Island an agricultural community and strawberry capital. This farm is a living part of Bainbridge Island history. 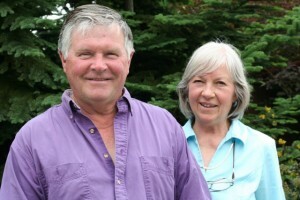 In 1976, The Bentryn’s purchased part of the farm to start Bainbridge Island Vineyards. Today is it is one of a handful of working vineyards remaining in Western WA. This is the only vineyard in Western WA never to use insecticides, and the the first Salmon Safe Certified vineyard in WA State. In 2000, about half of the farm was sold to the City of Bainbridge through an Open Space Levy to be kept as farmland in perpetuity. This working landscape is now part of our Bainbridge Island’s community commons. 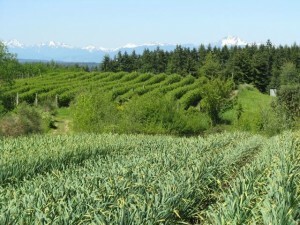 Looking towards the Olympic Mountains over Day Road Farms. 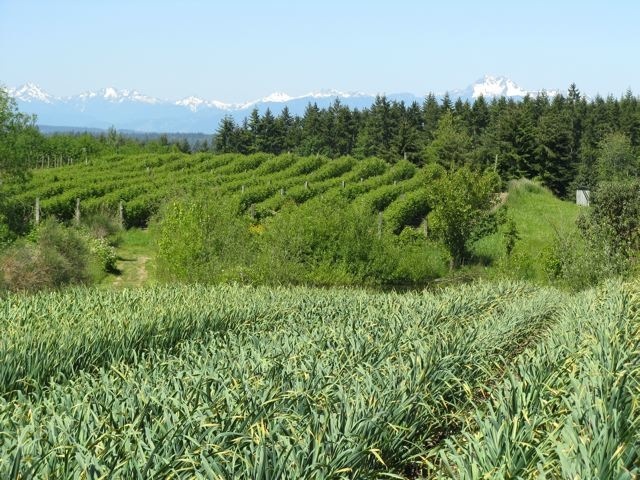 This 40 acre farm is the largest working farm on Bainbridge and one of the largest in Kitsap County as well as working landscape that produces 80-100 tons of food per year. 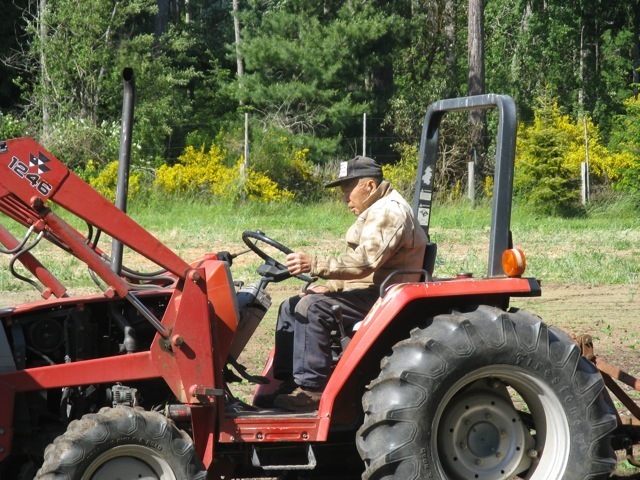 The primary crops grown on the farm are raspberries, corn, pumpkins, grapes, potatoes, garlic, onions, and a variety of seasonal greens. It is also one of the most popular site for bird watching on Bainbridge Island.